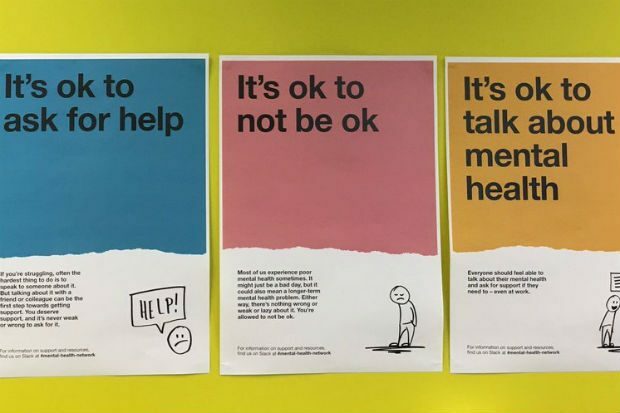 Today is World Mental Health Day and at the Government Digital Service (GDS) we’re joining in with a number of activities to break down taboos and raise awareness of the support and information available to colleagues. We’ll be starting the day with a wellness breakfast - run in conjunction with the Black Asian Minority Ethnic network - and we’re teaming up with the GDS fitness club to promote the importance of exercise for good mental health. In the afternoon we’re hosting a mental health discussion (with tea and cakes). People will also be able to buy green ribbons to raise money and awareness for the Mental Health Foundation. At the 2016 GDS unconference, staff decided a mental health related network would be a good idea. So we formed a working group to create the network and coordinate activities. We want GDS to have great collective mental health and be an even better place to work. We take a user-centred approach to the network, seeking to understand the needs of our colleagues and to provide a network that can help meet them. We want to help colleagues get the information and support they need. We’re here to help give voice to their mental health related questions and concerns. It’s not an easy task. There’s still a lot of stigma around mental health. A particular challenge, not unique to this topic, is that colleagues’ involvement is often private, sensitive and invisible. It’s hard to measure what we do. online Q&A events, where colleagues (anonymously, if they like) suggest and vote for topics. Afterwards, we capture, anonymise and store all questions and replies in a Google document that anyone can access as an ongoing resource. weekly picnics for colleagues to meet up, discuss the network and share their experiences or just their lunch! Read more about the Mental Health Network's principles. If you work at GDS you can find mental health information and resources on the wiki. Just search for ‘mental health network’ or visit the #network-mental-health channel on GDS’s Slack. You can access resources on mental health by visiting Mind, CALM (for preventing male suicide) and if you’re into podcasts, Blurtitout. Helen Nickols is a senior content designer and Ben Carpenter is the lead of Inclusive Services at GDS. They are co-leads of the Mental Health Network. Great post! This is so important and when I was at GDS I always felt it was a place I could be open and honest and that I would always have the support of a great bunch of colleagues (which included Ben!). In DfT we have a brilliant level of support for Mental Health awareness and it is so good that this issue is really coming to the forefront now across Government. Thanks Alan, and good to hear DfT is talking about mental health too. This is great. Thank you for sharing. We're just setting up our own mental health network at Softwire and it's great to get some ideas of what others are doing in this area. That's great, hope it goes well at Softwire too. It's something we should all be able to talk about.